The Dawn of New Year brings the message to the Mankind to strive for the peace and peace alone. All the prophets and teachers whether he be Krishna , Christ or Buddha have shown us the way to seek the peace within. They have proclaimed that Peace is your birthright. Seek purity, be true to thy own self. Struggle for the perfection. Shun the lust, greed and anger. Uplift thyself from the lower nature, stand up, be bold, be courageous and march on towards the shining horizon of the absolute. Seek the truth. Let us all pray for universal peace & harmony around the globe. Let us all work for economic, social and spiritual upliftment of mankind. Let there be no war or terrorism. May the Lord’s Blessings be ever upon us. 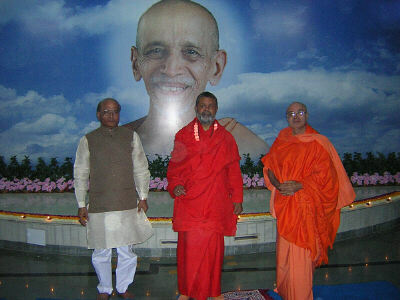 May the most worshipful & revered Guru Bhagwan His Holiness Swami Sivanandaji Maharaj’s abundant grace be upon us all. It is a sincere & heartfelt prayer at the dawn of the Year 2004. On the occasion of Golden Jubilee celebration of Geeta Vidyalaya Sadhana Mandir, Pujya Swami Adhyatmanandaji was invited for Spiritual Retreat. Three hundred and eighty Yoga enthusiasts attended morning Meditation & Pranayama classes guided by Pujya Swamiji. Evening discourses by Pujya Swamiji on the subject of “ Geeta in Daily Life”, in which he elaborated the Teaching of Geeta in solving day to day problems of life. Geeta Jayanti was celebrated on Dec 2, 2003. All eighteen chapters and gist of Bhagavad Geeta's message was enunciated in nine days. Swamiji attended Silver Jubilee function of Geeta Bhavan at famous Kashi Vishwanath Temple. During the function, prizes were awarded to the winners of Geeta recitation and Geeta essay competition. Swamiji Himself had studied Geeta from this Vidyalaya twenty five years ago. “Geeta Ratna“ award was presented through hands of Swamiji Maharaj to past students of this esteemed Vidyalaya, many of them today are doctors, engineers, leading businessmen and administrators of Gujarat State. In order to prepare worthy yoga teachers in quest of spreading science of Yoga and making it available to everyone, a residential camp was organized at the Ashram under the leadership of Swamiji Maharaj. Main topics covered were Human Anatomy, Physiology, Yogasanas, Pranayamas, Meditation, Eastern and Western Philosophy, Philosophy of Geeta and Patanjali's Ashtangna Yoga. Thirty participants attended the course. 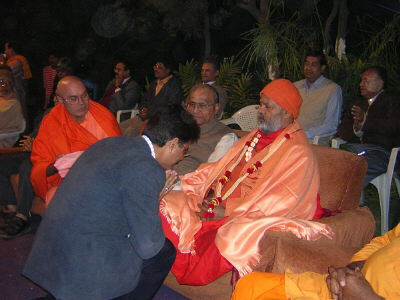 Christmas eve (Dec. 24, 2004) was celebrated in the ashram with prayers and meditation. 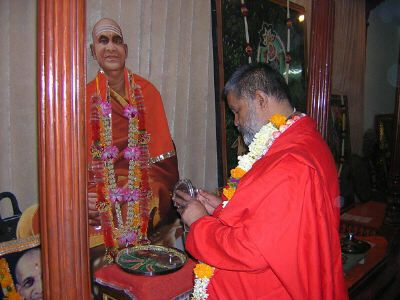 On Dec 25, 2003 evening, the entire group of teachers training course accompanied by Rev Swamiji Maharaj attended holy birthday celebration of Shree Krishnanand Teerth. On Dec28 Shankprakshalan Kriya (Total Cleansing of gastro-intestinal system) was performed and all the students of Yoga Teacher Training Course (YTTC) had participated and learned it as a part of the curriculum. Shree Vallabh Vishwa Vihar Education and Charitable Trust of Vaishnava youth organization of Gujarat State organized its 8th Annual Maha Adhiveshan on Dec 20 & Dec 21, 2003 at Halol near Vadodara. About one and a half lacks youth had participated in this momentous event. Spiritual leaders of various organizations were invited to address the gathering. Rev Swamiji Maharaj spoke on “Unchanging Eternal Values of the Yore and its needs for the Modern Youth” which was highly applauded by youths. 608th Yogasan Camp for general public was organized at Ambubhai Purani Physical Education playground near Kankaria Lake. Seven hundred beginners attended the morning classes from 5.30am to 7.00am & learnt preliminary flexibility, relaxation exercises, yogasana, pranayama, and meditation from Swamiji. Team of eminent doctors of various disciplines including Cardiology, Ophthalmology, Nephrology, Diabetologis and Orthopedics provided free consultations to needy during the camp. Dec 29, 2003 - Jan 2, 2004 Vice Chancellor of Gujarat University hosted international Conference for World peace. 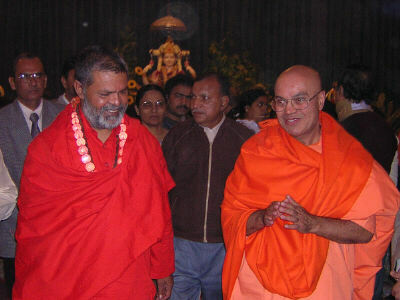 On Jan1, 2004 at the main gathering Rev Swamiji was invited for discourse on “Yoga for the World Peace". Rev Swamiji Maharaj laid the emphasis that world peace will not be possible unless and until each candidate spread the message of peace. In the evening of New Year day Sivananda Ashram had the privilege to welcome all the delegates, participants, speakers and organizers of the world peace conference. About five hundred delegates were present. On this occasion a troupe of expert folk dances (Dandiya and Ras) of Saurashtra gave a performance and made evening memorable and pleasant. Prasad (Dinner) was served to all.